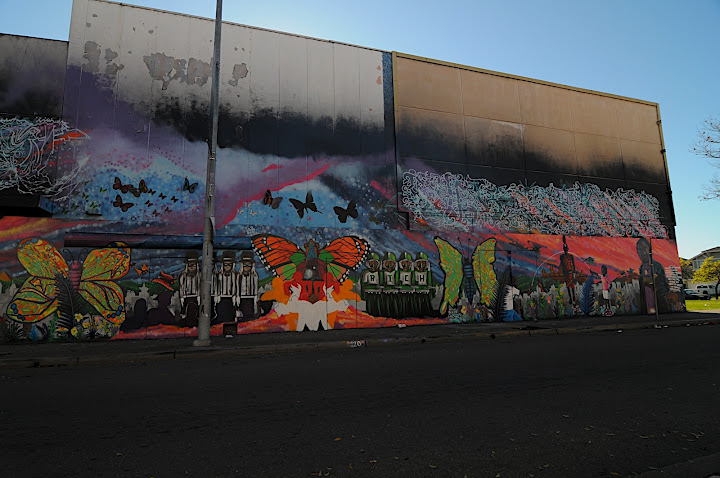 In 2008, CRP was commissioned to paint a new mural over a community project led by Harold Beaulieu on 8th and MacDonald that had fallen into disrepair. CRP kept the original theme of butterflies as representatives of our ancestors and integrated the Richmond Robottin’ culture that helped define west coast funk dance styles and had a major influence in hip-hop. Original robot dancers, Ralph “Plik-Plok” Mantejo and Eustinove Smith served as consultants for the project and brought through many of the original dancers for an amazing block party.